The Good, The Bad, The Elazul: Egypt: A "Civil War" is here. 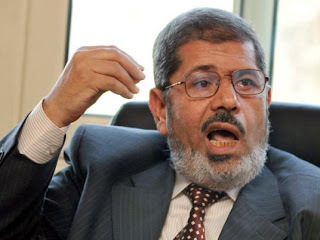 As you all know Morsy has decided to bestow upon himself dictatorial (super) powers, that have united all non-islamist powers against him. Due to this and many other factors, it is feared that Egypt will descend into Civil war, but the reality is a Civil war of "protests" or "Numbers" has already started, have no doubt the MB (Muslim Brotherhood) are the ones who started it. The keys to this are Damanhur and Assiut. Part of the MB's Argument is that Egypt is not Cairo, and they proclaim the majority support them outside of Cairo, However simultaneous protests all over Egypt would disprove this false claim. The fact is the MB are unable to rally enough numbers to counter the numbers their opponents can rally inside Cairo without busing in their supporters from the other Governorates. In particular, The MB's power base is mainly in rural areas, while their opposition is usually concentrated in urban areas. As a fact, Cairo is the most urbanized governorate of any Egyptian governorate. As such, protests in each governorate are independent battles in the general war. The MB lacks the ability to rally enough numbers to fight in both the governorates and Cairo simultaneously. Due to this The MB have called for protests in the governorates in the next two days, so that they can win the battles of the governorates before the major anti-Morsy protest in Cairo on Tuesday, so they can in turn utilize their strength from the governorates in the "Major" Cairo battle. The previous points clearly explain why the MB are currently attempting to destroy opposition in Damanhur and Assiut, which are traditionally MB strong holds. If the MB plan to win the battles in the governorates before Tuesday is successful, then by default the outcome of the major battle of Cairo is moot, because they will then be able to successfully rally their governorate supporters and "Show" that they have enough support in Cairo to come close to if not match the Anti-Morsy opposition in Cairo, much like they did on Friday. It's a basic war strategy. Combined with the divide and conquer strategy; in this instance, they are attempting to decrease the strength and numbers of their opposition by utilizing “Useful Idiots” to create clashes within the opposition dividing them into "Feloul" and "Revolutionary" camps. Yes, it may not have come down to an actual bloody war yet have no doubt; this is a "Civil War"
Interesting analysis, but a question on the useful idiots who spread violence. How do you know they belong to the MB? Plausible, surely, but on what foundation do you say?